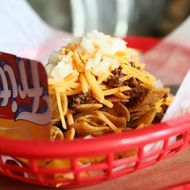 The Frito pie served at Mable’s. Chili, cheese, and chips … what’s not to love? Frito pie is big in Texas, where Gabe Thompson of L’Artusi used to grab a bag in the cafeteria snack line at school, and he paid delicious homage to his childhood memory at this September’s San Gennaro festival. Enamored with the “walking taco,” we set off to find versions at dive bars and barbecue restaurants around the city, and we hit the chili-laced motherlode, turning up worthy specimens at everywhere from Williamsburg watering hole the Levee to East Village cocktail haunt the Beagle. Check out our slideshow to see how each of the gut-busters stacked up.